An international LOFAR station is made up of two fields of 96 antenna elements each (96 LBAs and 96 HBAs). Given that each antenna can receive in two polarisations which both need their own cable, this makes for a total of 384 cables between the antennas themselves and the RF-container. Together, these cables have a combined length of 36,360 metres (just over 22.5 miles). 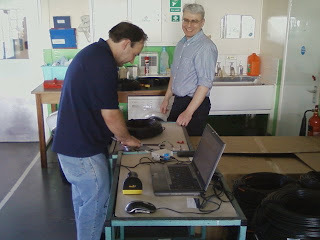 The cables will be buried into the ground before the antennas are deployed. However, before doing this, each one needs to be tested for its electrical characteristics. It is painstaking work, but this verification work is extremely important. 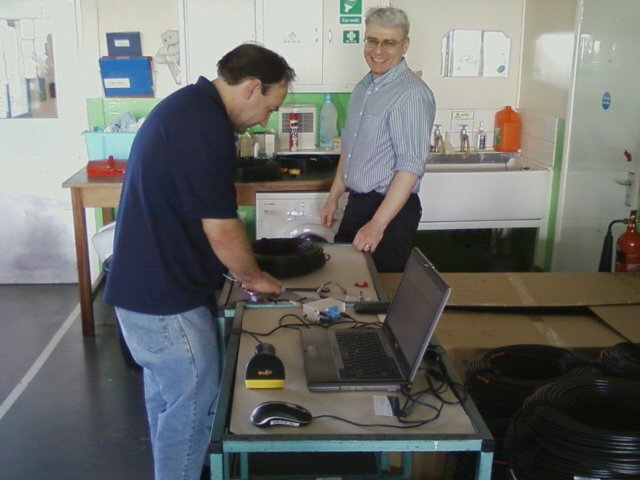 In the picture, Mike Willis and Harry Smith are very happy to have completed the last of the lab testing of the 384 cables.